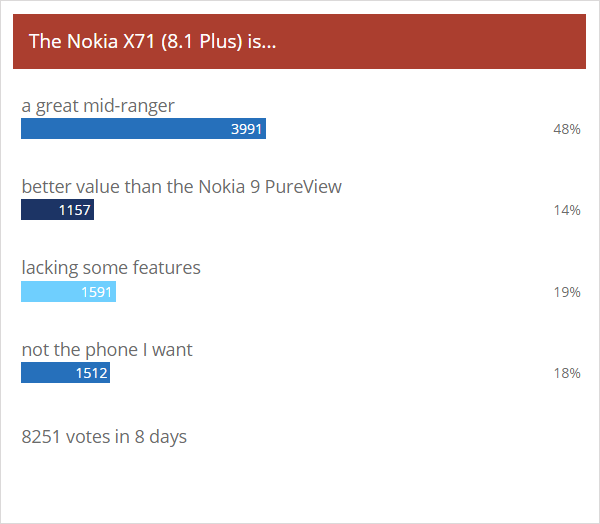 The Nokia X71 is a great mid-ranger � most people who voted in last week�s poll agree. However, it�s not perfect, it�s certainly not going to challenge the Nokia 9 PureView as the top HMD phone. And since the X71 is expected to go global as the Nokia 8.1 Plus, some questions were raised if it is indeed better than the Nokia 8.1. The chipset is a downgrade, going from Snapdragon 710 to 660. You do get more RAM and storage as standard, though. The camera has also been called into question � the 48MP sensor has the resolution (and with binning, potentially larger pixels), but there�s no OIS. And the punch hole selfie camera has 16MP resolution instead of 20MP. Minor things on their own, but it�s not a good look on a �Plus� phone. Still, the X71 packs the highest resolution sensor of any Nokia ever, plus the first ultra-wide camera module. Plus, the cleaner lines of a punch hole selfie camera instead of a notch. And HMD has done a good job of keeping its Android One fleet up to date. In the end, it will come down to price. The Nokia X71 goes for around $385/�345 in Taiwan. HMD is yet to unveil the plans for a global rollout. For comparison, the Nokia 8.1 goes for �360-390.